Hydrogen technology will change the world. Responding to clean mobility, addressing climate change and transforming energy infrastructure. According to the vision of Hydrogen Counsil the hydrogen will be powering more than 400 million cars, 15 to 20 million trucks, and around 5 million buses in 2050 (source Hydrogen Counsil). 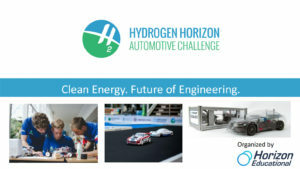 Because nvias.org see the future in the hydrogen tehc, we’ve joined the Hydrogen Automotive Challenge (H2AC), an educational program ending with the endurance race of hydrogen cars. The Information Technology Administration of the City of Pilsen sponsors the Pilsen team, which will be composed of students from Pilsen secondary and grammar schools. The hydrogen car is basically a standard electric car or vehicle (EV) where the primary source is not a battery (BEV) but the fuel cell (FCEV). The Fuel Cell generates electricity by combining hydrogen and oxygen. The waste of this process is pure water and heat. The program is mainly implemented as a leisure activity. → Why would you want to be a team member? → What can you offer skills?